It is time again for one of the longest fought and most bitter rivalries in all of college football- the Apple Cup. The yearly match up between the University of Washington Huskies and the Washington State University Cougars is especially important this year, as the Huskies will be moving on to a bowl game if they can muster a win. The chance to deny Washington that pleasure will likewise embolden the Cougar team, fresh off an impressive 31-14 upset against Oregon State. 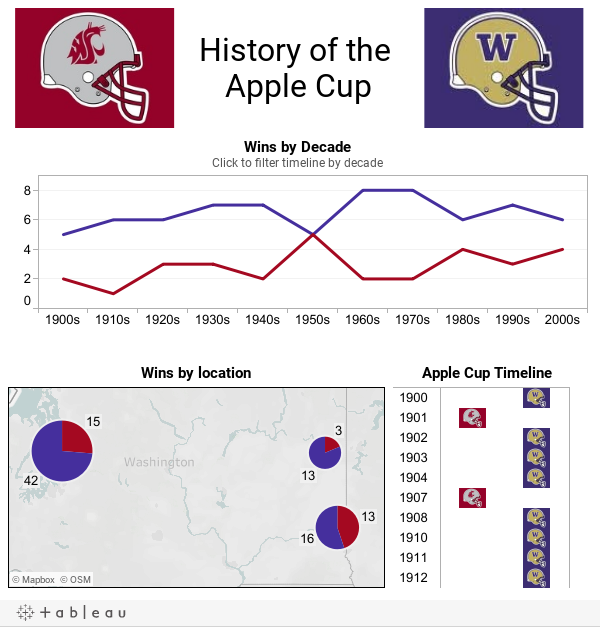 Take a look below at the 100 year history of the Apple Cup. Thanks to Dan Carpenter, salesman extraordinaire, for this viz. Clearly, the Huskies have dominated the Apple Cup over the past century with a decisive 69% of all victories. This may have been influenced by the initial format of the game, in which the winner took home field advantage for the next year. There is little doubt the Huskies were the superior team in that period, but to what degree the home field advantaged influenced their performance cannot be determined. The Huskies also clearly benefited from the Cougars lack of a true home field advantage from the 1950s to the 1970s, when WSU's home games were played in Spokane. Full disclosure: Ross Perez is a UW graduate.